I find it hard to locate specific topics, I.e., sports, weather, etc. 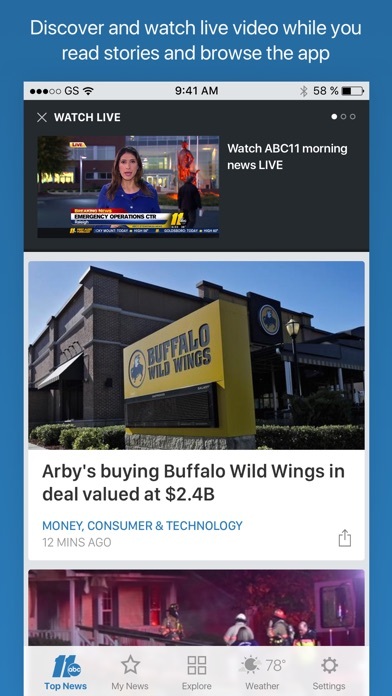 ABC11 is the only news app for me! I really appreciate how ABC11 provides immediate updates on events that effect my local area (Raleigh-Durham) as well as breaking national news. Favorite TV Station. Have all news and everything yu need know about. Weather . And all. Love this news stations. Good reporting but would like more real time videos. There appears to be no way for me to search for news that interests me. Why is there no search bar? Often I get a notification from your site, only to go try and find it later, it’s impossible. Strange website design...not user friendly. I love the app but I really don’t like that every time I click on a “title”or segment I have to watch an advertisement. The most important part of this app is the radar. The area that I live will show yesterday area. I need to know when a storm is coming. I sent a text to see if they could fix it. It has not been fixed. A few months ago I complained about having to watch ads before I viewed a video. It was very annoying and made me not use this app as much, but today watch about 6 videos AD-FREE. Thank you to whoever did something about that. I don’t like the way this is displayed. It’s not smooth when scrolling from one story to the next. There is no overview on the news and it would be better to choose on your own which stories interest you instead of having to scroll and scroll before you find the story you’re looking for. The anchors, the reporters are the best in the business! It’s not better. The old layout was more user friendly. I just got the app on my iPad. I need to remove it. Today’s news is not that relevant as it is very biased anyhow. It does not reflect working America’s values. I can find more real news and better perspectives through google searches. TV 11 is my favorite news source both online and on TV. But the format of this new app I don’t like. I can no longer scroll and read articles easily. Having to scroll through all articles is frustrating. Please consider the old format. When I click on my news the whole app crashes. Worst app I have ever seen or tried to use. Give it a one star because there was not one listed as “zero”!! Now they take the comment section out so they don’t have to hear what the people have to say. The latest upgrade makes the app unusable on an iPhone. What was once a good user interface is now one of the worst. This app is horrible. Just terrible app. No election returns???? When I pull up the Doppler or ask it to animate. The screen goes blank and I am not able to use it except for look at it in the original format, rather than bigger and easier to see. I like your Doppler the best and I’ve been having to use other Doppler’s. Fix this please. Thank you. Too many ads. Ads automatically play and interrupt reading news stories, causing frustration. If I wanted commercials I would watch tv. 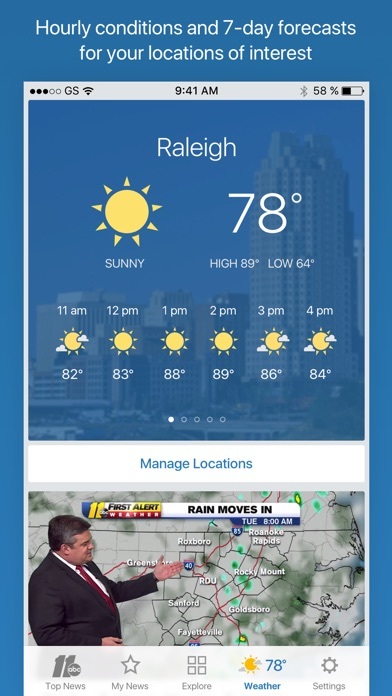 Love the ABC 11 App. Great News reporting! I give it 0 stars if I could! I do not like this new app! I gave it awhile to see if I liked it any better but it is terrible! It is not user friendly! It only gives u the news it thinks u want in terms of videos and u cannot search and find anything. In the weather department, the radar portion will not load! As a loyal viewer I am begging u to please fix this or bring back the old app! WTVD is always up to date with all the news and weather. They have the best reporters around! The app crashes and won’t open more times than not! Good app, why hate Johnston? I don’t know what genius decided to change the app to make it harder for viewers to find stories and use it. It’s just terrible now! Scrolling, scrolling, scrolling... by changing every story to an embedded video block it means tons of extra scrolling and it’s much harder now to find stories. I find myself hardly using this app now. It’s too frustrating. Agree 100% with NCDCUK’s review. UPDATE: This crapapp just got worse. Now today Kraft ads keep popping up even though I definitely DID NOT click on them. What is this? International Annoy the Customer Day? Original review: I used to be able to easily see several headlines on the screen and pick what I wanted to read. Now, I can only see one at a time, and sometimes that one isn't even a story, it's an ad. And to top it off, on many of the headlines the video starts playing while I'm trying to read the headline to figure out if I want to read the article in the first place, which is very distracting. What were they thinking? Let's just make everything bigger and more in your face? Did someone really think this was an improvement? And then there are the reporters' Facebook posts or a video that are embedded in the article, but scroll separately - that is, you can't scroll the article and have to somehow find a sliver of screen above or below it to get some scrolling traction. What were they thinking? And finally, there needs to be a better way to report grammatical errors for the reporters who slept through Language Arts classes and are too lazy to check the copy for incorrect homonyms or can't remember the difference between "its" and "it's". By the time I get to the Contact Us page, I don't remember the headline or have the whole incorrect sentence memorized. Why don't you put a Report Typos button on the bottom of every article? And why do I have to type in my name and contact info just to politely let you know of yet another error? Keep It Simple! I liked seeing a listing of headlines where I could pick and choose what I want to read. I don’t like paging through a lot of videos, ads, and useless information that now shows up. Love ABC11, how I start and end my day. 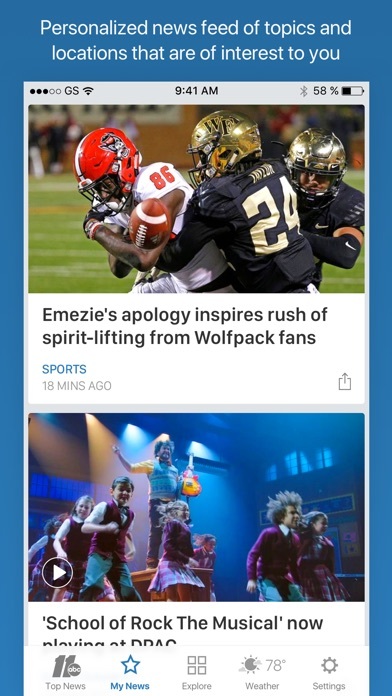 I used to absolutely love this app, but the redesign is one of the worst I’ve ever seen. I can’t find anything anymore without flipping through a million tiles first. Just awful. Someone needs to be fired! I do not like the new design. No search bar and hard to get to stories. The old format was much easier. I rarely use it now. I’ve loved TV 11 News. It’s always been the first news app that I read each morning; however, the new format, with videos for each article, is no longer my go-to news app. I take the news very seriously, and I feel like your new format detracts from that. Whether just perceived or not, your news articles seem to be less in depth. I can no longer take in the most important news at a glance; whereas previously I could readily see the scope, importance, and perspective of the day’s news. Please bring back the old format! Or perhaps consider utilizing 2 apps to please both types of readers. Deleting the new app. It was fine the way it was. Now I only see Top News. Even though I didn’t choose Entertainment as My News, I’m still stuck with it. I cannot browse stories. Where did the news go? Ever since the app changed, I’m having problems with links working. It’s also more tedious in navigating around to what I want to see... PLEASE PLEASE go back to the way things were before the major overhaul. I don’t like the new app. Half of the articles don’t load or only partially load. Go back to old app. Much easier to navigate and always loaded everything. Whoever thought the new update was a good idea should be fired. They obviously never beta tested it with real users. Who wants to have to scroll through every story instead of going down a list and picking which are relevant to you? 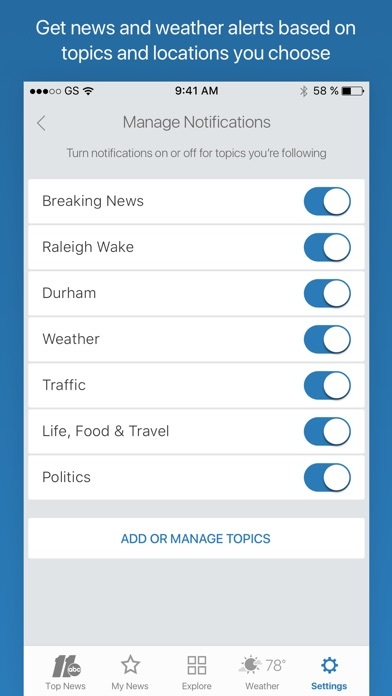 I’ll be deleting this and using WRAL. 👎🏻 to the app updates. 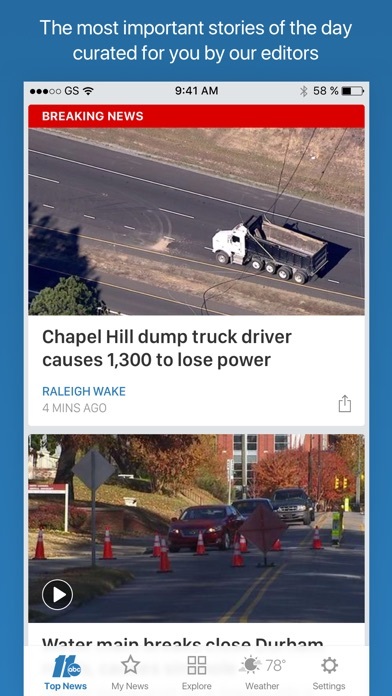 Used to love this app, but since the updates I’ll be using WRAL’s app now. Deleting app today. Can’t stand the new format. Bye ABC. Hello WRAL. Is there a reason your weather app is so limited? All the other local stations are more detailed.